Yay! This is the sixth post of the year for the 2017 GrannySpiration Challenge! I am so excited to see what everyone has been working on, especially you! At the end of this post, you will find the information for this month’s giveaway, and link up. I will start by apologizing that I did not get my full post up in time! I was unsure of what I was going to be sharing this month, and last minute pulled this together. I planned on putting my pattern up here yesterday after work, but I came home and was so tired, I just laid down on the couch and watched tv until bed. Todd and I did watch the Edge of Tomorrow with Tom Cruise, and I will say, that was a pretty interesting movie. It’s similar to Groundhogs Dog in which he relives the same day over and over, but it’s filled with lots of action as it’s during war time, and of course the race to figure out why the day is repeating and how it can be resolved. Anywho, I have been on a mission to find my favorite worsted weight yarn that isn’t Hobby Lobby’s I Love This Yarn. Why? 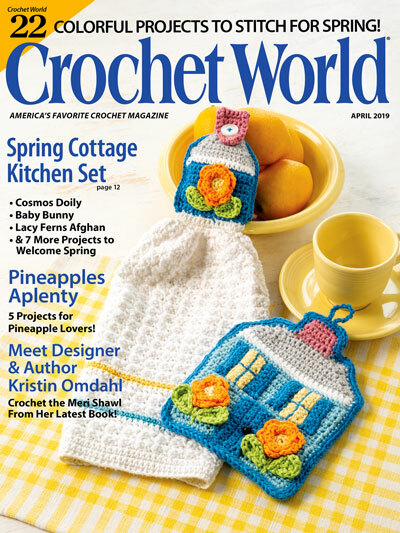 Because I am wanting to create some crochet kits, and Hobby Lobby unfortunately does not off bulk discounts. *Sad face. This was my first experience with Berroco Vintage Yarn, but I really love how this yarn feels and worked up. It’s a more lightweight worsted weight yarn, and has really beautiful stretch being that it has some nylon in there. The wool is nice and cozy, and not itchy. 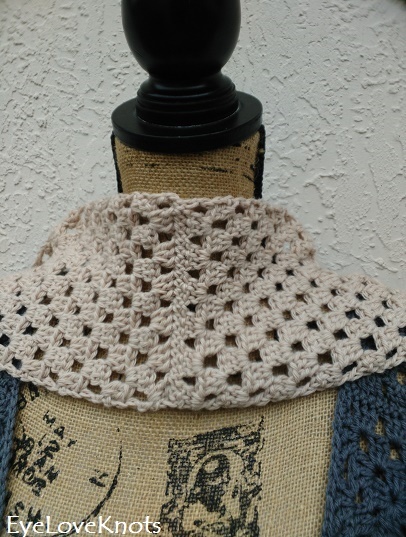 It feels a like a mix between Lion Brand’s Vanna’s Choice and Heartland Yarns. The thing I like about this yarn, that I don’t like about some others, is the fact that it doesn’t get fuzzy and icky looking with heat from fingers, or ripping back, though I wouldn’t suggest excessive ripping out as I think it would get fuzzy. The label says it can be machine washed and dried which is another great perk, though I haven’t tried it yet. My favorite local yarn shop carries this, but you can also find it online – just not through Berroco as they do not sell to the public. 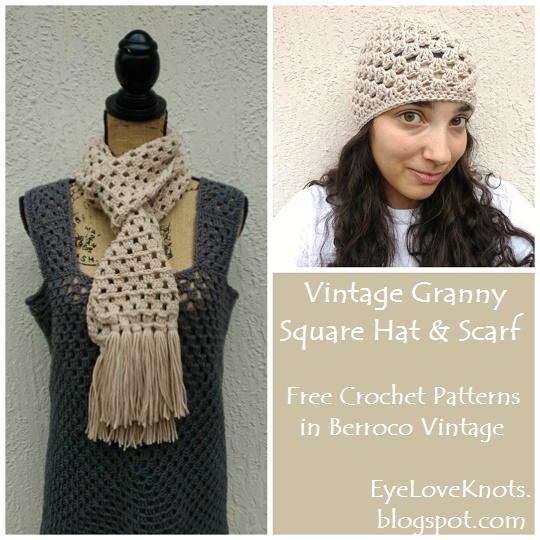 In continuance with the desire to create some crochet kits, I thought the first place I would start is with my popular Granny Square Hat and Scarf <3 I have updated my Granny Square Beanie pattern that I first posted back in March of 2014! 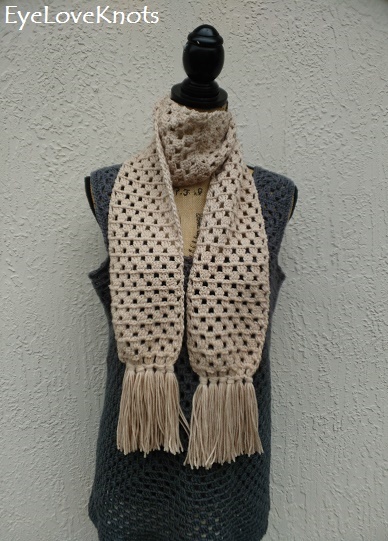 And using my Granny Square Scarf as a basis, I made this scarf slightly different. The biggest difference is that I created two pieces and sewed them together so the granny stitch pattern would be facing the same direction from both ends, whereas in my original Granny Square Scarf, the pattern is right side up on one side, and upside down on the other end. I never noticed before working this one up. I also added a fun fringe 🙂 Enjoy! From Your Hosts: May in a Little Bag (Crochet Inspiration) from Kat Kat Katoen, Simple Granny Dishcloth (Free Crochet Pattern) from Rhelena, Summer Holiday Granny Bag (Crochet Tutorial) from Atelier Marie-Lucienne, Upcycled Reusuable Shopping Bag (Crochet Inspiration) from Mariam’s Creations, Granny Square Bear Lovey (Free Crochet Pattern in German) from Hakelfieber, Life Squared (Life) from Crochet is the Way and Two Grannies Headband (Free Crochet Pattern) from EyeLoveKnots (that’s me!). Please make sure to stop by our other co-host and see what they’ve been working on too. In the image above, you’ll find their projects (and mine) from last month’s challenge. I had my hat done up in about an hour, and scarf in about two and a half hours. Hat pattern includes Adult Small and Large Sizes. Each have a crown of about 6.25″ (6.75″) in diameter, a circumference of nearly 19.75″ (21.25″) to fit a head size of 20-22″ (22-23″), and fall 7.75″ – 8.5″ in length. 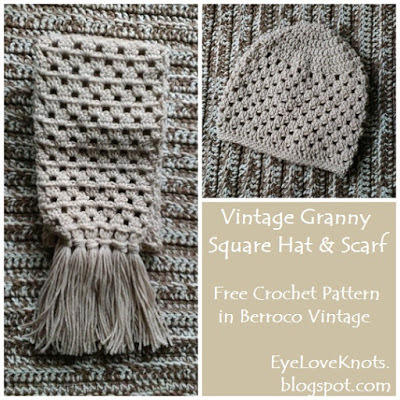 For the rest of the instructions including Pattern Notes for the Granny Square Beanie, please visit my free Women’s Granny Square Beanie Crochet Pattern. For the foundation row, you will work into the back bump of the chain to create a nice, clean and even foundation row. If you plan on working a final found of single crochet around the scarf, you can work the foundation row as you normally would as the single crochet edging will create the same effect. 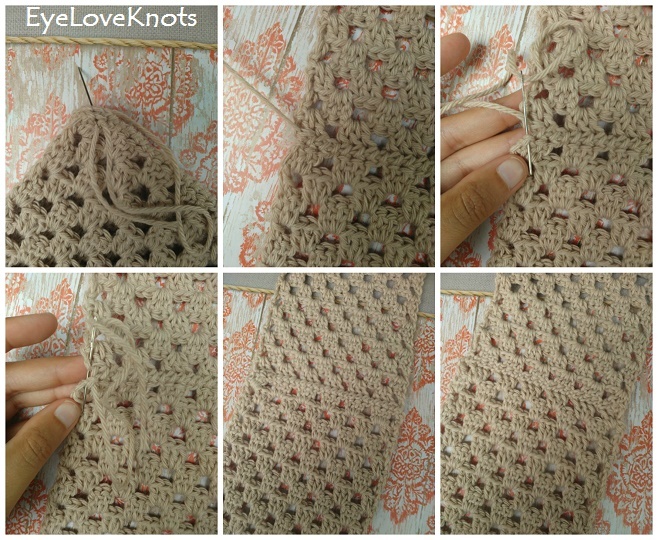 Beginning chain 2 counts as a double crochet, as does the first four chains of the foundation row. Chain 23. Working into the back bump of the chain: Work 2 DCs into the 5th chain from the hook, chain 1, skip the next two chains, (3 DC into the next chain, chain 1, skip the next two chains) 5x, 1 DC into the last chain. R2 – 54: Chain 2, turn. Work 2 DCs into the 1st chain space, chain 1, skip the next cluster, (3 DCs into the next chain space, chain 1, skip the next cluster) 5x, 1 DC into the top of the beginning chain 2. Fasten off. When fastening off the second one, leave a longer tail for sewing. It’s best to weave in ends now, keeping the longer tail loose. 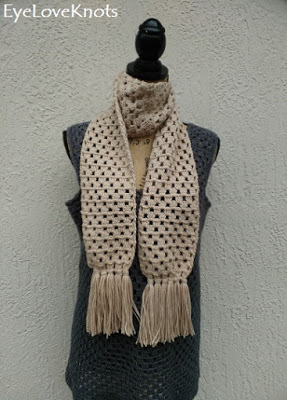 Lay right sides of the scarf together, and whipstitch the two pieces together. 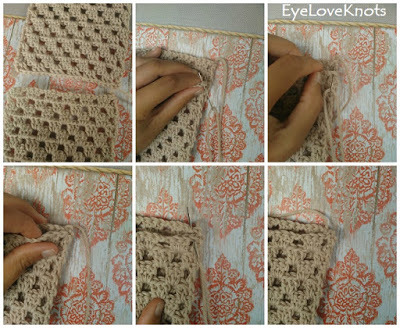 Make sure not to pull your stitches too tight, or the piece will bunch at the seam. This collage shows laying the pieces in preparation for stitching, inserting needle underneath both legs of the stitch is important and making sure to stitch through both layers (top row), followed by what the first stitch looks like, working into the next stitch making sure to line up both stitches, and what the second stitch looks like (bottom row). You can click on the image to view a larger one. This second collage shows a reminder not to forget the last stitch, then to lay the piece flat and bring the yarn and needle down to the bottom piece to close up the gap (top row), followed by repeating from the top piece down to the bottom piece to finish closing up the gap, a view of what the piece looks like from the wrong side and then what the piece looks like from the right side. You can click on the image to view a larger one if needed. The seam is barely noticeable! Cut 120 13″ strands. You may want to sit them aside in groups of 10 as I did for mine – this is how you will attach them. 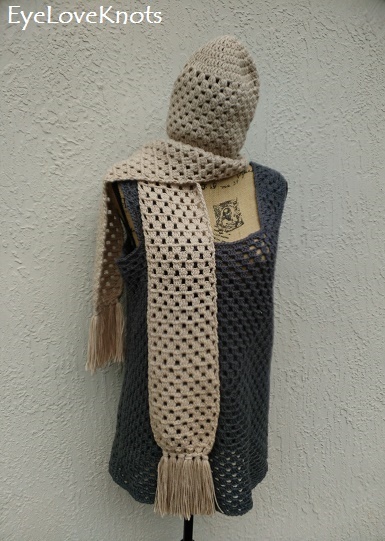 Lay scarf down with ends pointing away from you, and wrong side facing facing up. Grab a group of fringe pieces, and fold them in half. 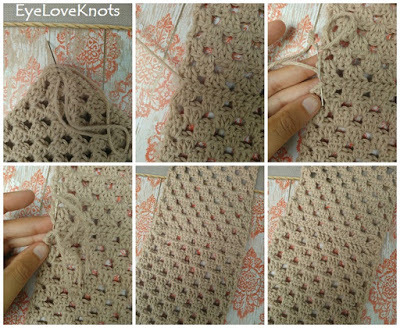 With hook in your other hand, insert the hook into the same stitch as a granny square cluster, grab the loop of the fringe with the hook, and pull through enough to fit your fingers through. Remove hook, insert your index finger and thumb through the fringe loop and pull the fringe tail through to create a knot. Make sure you get all loops through, otherwise stragglers will fall out. Your knots should show on the right side of the scarf. Repeat across working 6 loops to create the fringe. Once all fringe is attached, take your scissors and trim down so it is all even. Please feel free to make and sell your own Granny Square Hat/Beanie and Scarf using these patterns, but please DO NOT claim these patterns as your own nor should you sell my patterns, and DO NOT re-publish my photos as your own. DO NOT copy and paste my patterns anywhere, link to it instead. Share your version of this Vintage Granny Square Scarf and/or Women’s Granny Square Beanie on Ravelry. 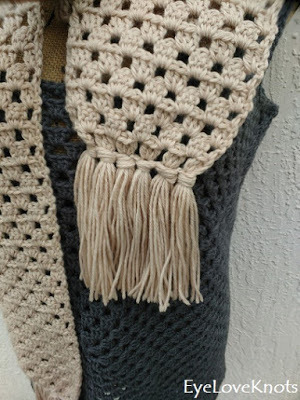 Check out the EyeLoveKnots Ravelry page to keep track of all your EyeLoveKnots favorites in your que, and share your WIPS and finished projects! This Month’s Giveaway is sponsored by Marjan of Atelier Marie-Lucienne! 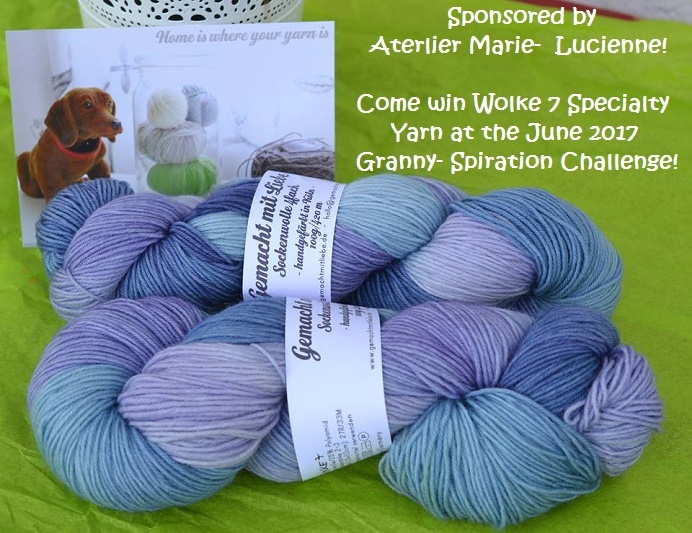 One winner will receive two skeins of Wolke 7 (or Cloud 7) yarn. It’s 75% virgin wool and 25% polyamid. Each skein is 100g/420m. Must be 18 or older to enter. Open to all countries. Void where prohibited. Winner has 48 hours to respond to email notification, or another winner will be chosen. 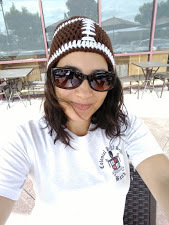 Helena of Rhelena/Crochet n Craft is responsible for prize fulfillment. The three most viewed projects from last month’s challenge can be found in the image above. From left to right, top to bottom: Sweet Treat Baby Blanket from Underground Crafter, Granny Square Cushion Makeover from Made by Demi, and Flower Granny Square Afghan from The Purple Poncho. 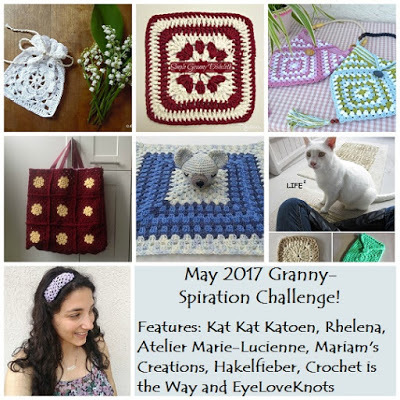 Now, Share Your Granny-Spiration Project With Us! New Granny-Spiration Projects will be shared from your hosts the first Saturday of each month. Post times will vary. You will be able to link up from 12:00am EST on the first Saturday of the month, through midnight EST on the second Thursday from the start date – specific dates are on top of the Rafflecopter form – giving you almost two weeks to link up and enter the giveaway! 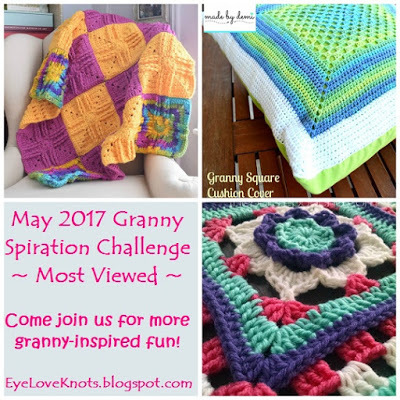 Please share projects that are family friendly, and GRANNY INSPIRED through use of regular granny square or solid granny square, granny stitch pattern or other afghan square in the form of a free pattern, pattern review, or inspiration piece. Not limited to crochet or knit. Please make sure to link to your post, and not your home page. *If you don’t have a blog, you can still share with us by creating a Free Flickr Account – powered by Yahoo. Add your projects there, and then come back here with the link for the project. *Link ups cannot be to Etsy listings or Ravelry pages where patterns are sold. You can link to blog posts, Flickr or Facebook pages, Pins, etc that are directed towards it, but can’t directly link to it. To be clearer though, Raverly pages of finished projects are okay to share. Sorry for the inconvenience! That’s per InLinkz guidelines. Thanks! Features may be chosen at the discretion of each host. By linking up, you give us permission to feature your item. Great scarf and hat! Goes with many clothing and styles, kind of an evergreen. Thank's for the pattern! That is a wonderfully classic set – Great for male or female, too. I had to look up the Berroco yarn because I've never seen it around here… With the fiber content, I bet that hat is nice and stretchy. A lovely set you've got here! Thank you for sharing! I love the scarf. 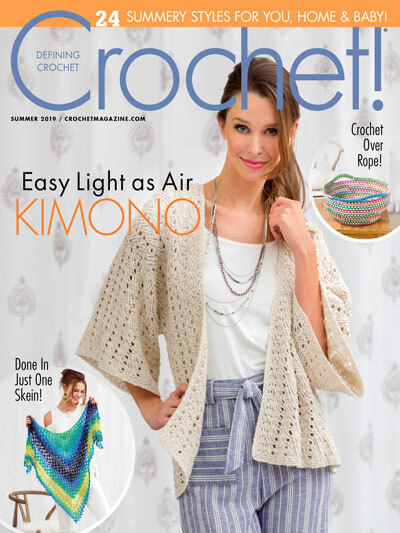 I hope to get some time to crochet soon again. I love your scarf! 🙂 Scarfs are often knitted – but I don't like to knit and I love to crochet! So it's perfect. Thanks for sharing your pattern at the Sew It Cook It Craft It Link Party. Beautiful set and by all means come to our Wednesday link ups if it's fashion related! Would love to see your lovely creations! This is so beautiful! I wish I had someone to teach me how to crochet. I've tried to figure it out on my own and it didn't go well. 😉 I admire your talent! Thanks 🙂 I learned from Emi of Hectangooa on YouTube. She's the only one who got through to me. Such a pretty hat and scarf set. Anyone would be happy to recieve this as a gift.